Red Medicine, the much hyped Vietnamese restaurant from Umami Burger owner Adam Fleischman and Chef Jordan Kahn, opened two weeks ago on Wilshire Blvd in Beverly Hills. The restaurant, which was showcased extensively at Test Kitchen, is their "homage" to and interpretation of Vietnamese food. The founders make no claim to authenticity, rather they are making the kind of food that they crave and find satisfying. The bar is open until 2 am, an oasis for late night food and drink in the area. The cocktail list is in continual development, with seven signature drinks currently available, each priced at $10. They include several numbered from 18 to 28, as Red Medicine does not name its cocktails. 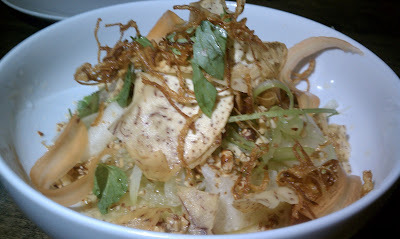 The bar menu also includes several items from the restaurant menu and one dish only available at the bar, Banh Mi. On a recent visit, the favorite dish of several dining companions was the Bahn Mi from the bar, so if you are a pork eater, it may pay to build in time at the bar to eat it, before you sit down for your main meal. The restaurant dishes are designed for sharing and menu sections include Hands, Cold, Protein and Veg. There is also a single "Large Format" option reserved for parties of 5 or more. The evening we went, the large format dish was Beef Brisket. The dishes in the Hands section are not surprisingly meant to be eaten with your hands, although this does not mean that they are not carefully composed. The Beef Tartare from that section was as elegant if not more so than anything else we ate during our meal. The fine dining background of Chef Jordan Kahn and General Manager Noah Ellis show in the plating of the dishes, which is anything but rustic. 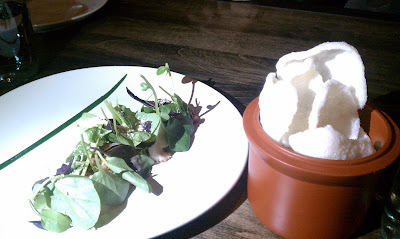 The Beef Tartare was my favorite dish of the evening. The tartare is presented in a straight line covered with mustard leaf, water chestnuts, spicy herbs and nuoc leo (peanut sauce). Chlorophyll is a parallel green line on the plate. A bowl of chips is presented in a bowl alongside, to use as a serving device for the tartare. The tartare is nicely spiced with some heat, and the crunch of the chip is a pleasant textural contrast to the other elements of the dish. Another highlight is the Green Papaya Salad ($9) from the Cold section, with pickled roots, crispy taro, tree nuts and nuoc cham. Duck ($16) from the Protein section is a five spiced duck with charred frisee, chicory, tamarind syrup, grains of paradise. 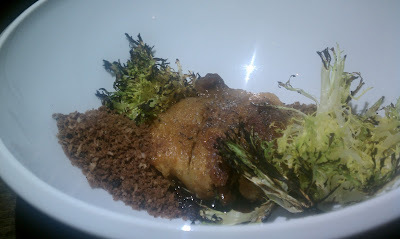 This is a small dish; note the charred lettuce. We ordered the Brisket with anticipation as the Large Format section requires 5 people to order it and it sounded special. 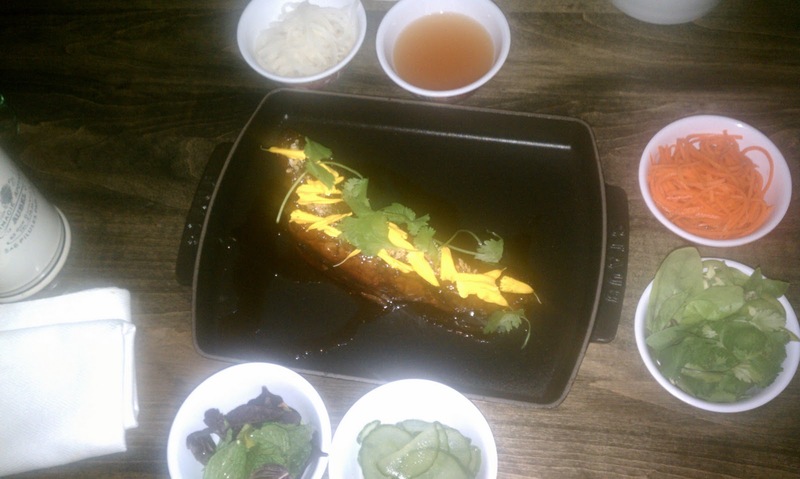 The dish is described as Snake River Farms American Wagyu Beef Brisket, Glazed with Palm Sugar & Fish Sauce. It was brought to the table with lettuce, carrots, pickles and dipping sauce, to create individual lettuce wraps. 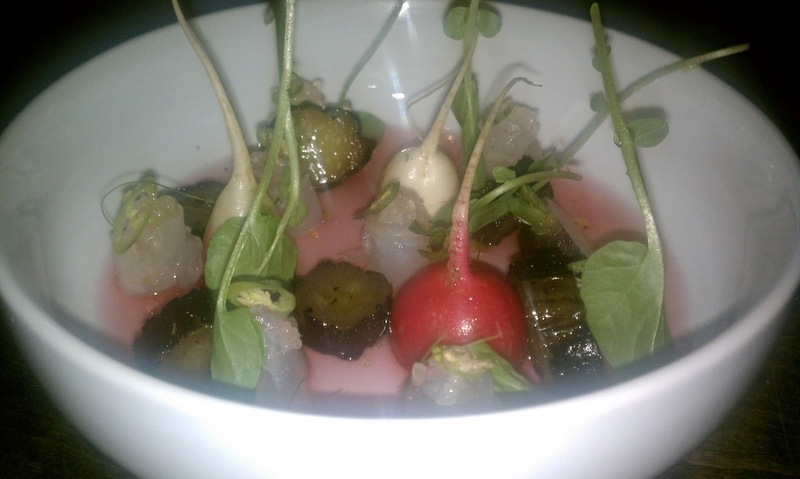 The presentation was compelling as the main dish was surrounded by a constellation of components. The brisket was good, but not as delicious as I had hoped. The concept reminded me of the large format dishes at Momofuku in New York City, but was not in that league. The brisket would have benefited from more juice/moisture. The picture below does not do justice to the Coconut Bavarois, which comes in a glass with coffee, condensed milk, thai basil, peanut croquant and chicory. The flavors and textures in this dessert transcend the dessert category to be a great dish, period. 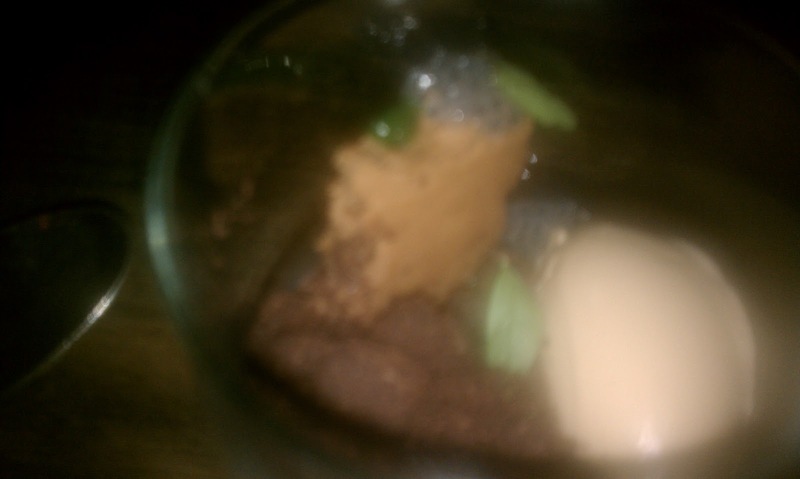 I am not a dessert person, but this was wonderful. Chef Kahn was a pastry chef at Varietal in New York and most recently at Michael Mina's XIV here in Los Angeles, and his skill with desserts shows. The beef tartare and the Coconut Bavarois are must orders. A dinner at Red Medicine is not inexpensive, but several of the dishes are very much worth it and it is great to see an ambitious chef put his own stamp on his cuisine here in Los Angeles. My next visit is more likely to be in the bar to get the tartare and a beer or cocktail, rather than the dining room due to the price point / value. Magnum: A Meal as Powerful as Its Namesake?